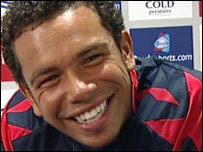 Sunderland have completed the signing of England midfielder Kieran Richardson from Manchester United. The 22-year-old has signed a four-year contract at the Stadium of Light and joins for an undisclosed fee, thought to be in the region of £5.5m. Black Cats boss Roy Keane said: "I'm well aware of what a good player and a good lad he is. He's ready for a fresh challenge and we can provide that." Richardson added: "Sunderland is a big club and it's a great move for me." Richardson, who began his career as a trainee at Man Utd, has been capped eight times by his country. He enjoyed a successful loan spell at West Brom in 2005 during which he helped them stay in the Premier League. He continued: "I know all about Roy Keane and I am looking forward to playing for his team. It's an exciting time for me." Richardson could make his debut in Wednesday's friendly at Darlington and he becomes Keane's fourth signing of the summer. The Black Cats gaffer has already bagged central defender Russell Anderson, full-back Greg Halford and striker Michael Chopra since they won promotion back to the Premier League.